The Federal Open Market Committee (FOMC) is the monetary policy-making body of the U.S. Federal Reserve System. Since 1981, the FOMC has had eight scheduled meetings per year, the timing of which is quite irregular, The schedule of meetings for a particular year is announced ahead of time. Starting in 1994, the FOMC began to issue a policy statement (“FOMC statement”) after the meetings that summarised the Committee’s economic outlook and the policy decision at that meeting. The FOMC statements are released around 2:15 pm Eastern Time. Before 1994 monetary policy decisions were not announced; investors therefore had to guess policy actions from the size and type of open market operations in the days following each meeting. There has been academic interest in the influence of these announcements on the relationship between monetary policy actions and ﬁnancial markets. This article presents a brief review and listing of academic papers on FOMC announcements and financial markets. Bomfim and Reinhart (2000) analysed the reaction of financial markets in the period after 1994 when the Federal Reserve started explicitly announcing its monetary policy decisions. They commented that the changes in disclosure practices potentially reduced the uncertainty about both the timing and the motivation for monetary policy actions. In their research they found little relation between the financial markets and the announcement of surprise decisions by the Fed. They concluded that Federal Reserve actions were more important for financial markets than their announcements. The following year Kuttner (2001) analysed the impact of monetary policy actions on bill, note, and bond yields. Kuttner found that the response of interest rates to anticipated target rate changes was small, while their response to unanticipated changes was large and highly significant. Regarding foreign exchange, Kalyvitis and Michaelides (2001) found evidence for an immediate overshooting effect for the US dollar in response to monetary policy shocks (unanticipated policy decisions). Andersen et al (2002), found that announcement surprises produced US dollar rate jumps, and concluded that high-frequency exchange rate dynamics are linked to fundamentals. They also observed that the market’s reaction was asymmetric: bad news having a greater impact than good news. Bomfim (2003) focused on the stock market which was found to experience abnormally low volatility on days preceding scheduled policy announcements. Although this effect had been only significant in the previous four to five years. The paper also found that the element of surprise in announcements tended to boost stock market volatility significantly in the short run, with positive surprises (higher-than-expected values of the target federal funds rate) having a greater effect than negative ones. Gurkaynak et al (2005) proposed that when investigating the effects of U.S. monetary policy on asset prices it was important to consider two factors: the current federal funds rate target and the future path of policy. By analysing high-frequency data from 1990 they found that both factors had important but differing effects on asset prices, and that FOMC statements had a much greater impact on longer-term Treasury yields. Fleming and Piazzesi (2005) observed that while Treasury note yields were highly volatile around FOMC announcements, the average effect of Fed funds target rate surprises on such yields was less marked. Their explanation was that yield changes were dependent not only on the announcement surprises themselves but also on the shape of the yield curve at the time. The most cited paper on this topic is Bernanke and Kuttner (2005) which attempted to quantify the effect of Fed actions and found that on average a hypothetical unanticipated 25-basis-point cut in the Federal funds rate target is associated with about a 1% increase in broad stock indexes. They also found that the effects of unanticipated monetary policy actions on expected excess returns accounted for the largest part of the response of stock prices. Lucca and Trebbi (2009) presented a technique to automatically score the content of central bank communication about future interest rate decisions from various news sources. Applying this technique to FOMC statements they found that short-term nominal Treasury yields responded to changes in policy rates around policy announcements, whereas longer-dated Treasuries mainly reacted to changes in forward policy communication. On the possible international effect, Hayo et al (2010) found that FOMC communication had a significant impact on European and, to a slightly lesser extent, Pacific equity markets. The following year Hausman and Wongswan (2011) broadened the scope to look at global asset prices and found that global equity indexes responded mainly to target surprises (changes to the current target federal funds rate); exchange rates and long-term interest rates responded mainly to the path surprises (revisions to the expected path of future monetary policy); and short-term interest rates respond to both surprises. They also found that the effect of FOMC announcements varied across countries, dependent on a country’s exchange rate regime (for equity and interest rates) and the scale of U.S. investment in the market (for equities). Hanson and Stein (2012) challenged the standard model that macro policy can not move longer-term real rates, by finding that a 100 basis-point increase in the 2-year nominal yield on an FOMC announcement day is associated with a 42 basis-point increase in the 10-year forward real rate. Previously most papers had looked at the effect of FOMC announcements on financial markets on the day of the announcement or subsequent to it, but Lucca and Moench (2013) found large average excess returns on U.S. equities in the 24-hour period immediately before the announcements. Further, these excess returns have increased over time and they account for sizable fractions of total annual realized stock returns (an extraordinary result). They found that such pre-FOMC excess returns occurred also in major international equity indices, although they found no such effect in U.S. Treasury securities and money market futures. On a similar topic Bernile et al (2014), found evidence of informed trading during lockup periods ahead of FOMC announcements. Putting a monetary figure on this action they estimated that informed traders’ aggregate dollar profits ranged between $14 and $256 million. Madeira and Madeira (2014) looked at the votes of the FOMC members (made public since 2002) and found that equities increased when votes were unanimous but fell when there was dissent. Cieslak et al (2014) documents an astonishing finding, that the US equity premium follows an alternating weekly pattern measured in FOMC cycle time. In other words, the equity premium is earned entirely in weeks 0, 2, 4 and 6 in FOMC cycle time (with week 0 starting the day before a scheduled FOMC announcement day). Abstract: Seasonalities and empirical regularities on financial markets have been well documented in the literature for three decades. While one should suppose that documenting an arbitrage opportunity makes it vanish there are several regularities that have persisted over the years. These include, for example, upward biases at the turn-of-the-month, during exchange holidays and the pre-FOMC announcement drift. Trading regularities is already in and of itself an interesting strategy. However, unfiltered trading leads to potential large drawdowns. In the paper we present a decision support algorithm which uses the powerful ideas of reinforcement learning in order to improve the economic benefits of the basic seasonality strategy. We document the performance on two major stock indices. The Ramadan Effect holds that stock returns are higher and volatility lower in Muslim countries during the holy month of Ramadan. This article presents a brief review and listing of academic papers on the Ramadan Effect. One of the first papers to address the Ramadan Effect was Husain (1998), who found a significant decline in stock volatility, albeit no change in stock returns, in the Pakistani equity market over Ramadan. Some years later Seyyed, Fazal, Abraham and Al-Hajji (2005), looked at the Saudi Arabian stock market and found a decline in stock volatility consistent with Husain (1998). From 2010 interest in this topic seems to have picked up with a greater frequency of papers appearing. First off was Bialkowski, Pawel, Etebari and Wisniewski (2010) who widened the ambit to look at stock markets in 14 Muslim countries; they found less volatility during Ramadan (consistent with the previous papers), but also found significantly higher stock returns. The paper also spent some time investigating the possible reasons for this, such as the health benefits of fasting and the influence of religious practice on investors’ psychology. Al-Ississ (2010), looked at 17 Muslim financial markets finding a positive effect on stock returns over Ramadan (consistent with Bialkowski, Pawel, Etebari and Wisniewski, 2010), but a negative effect over the Muslim holy day of Ashoura. The study asserts that these effects are due to religious experience rather than other secular factors. Bialkowski, Bohl, Kaufmann and Wisniewski (2013), observe that the Ramadan Effect is particularly strong in Turkey and that the performance of funds is substantially higher during Ramadan. A couple of papers failed to find the effect for the Karachi Stock Exchange (Shah and Ahmed, 2014) or the S&P CNX Nifty Shariah index in India (Dharani and N. Vijayakumar, 2014). These results may be explained by Al-Khazali (2014), who found that, while the effect does exist in most Muslim countries, its magnitude diminished during the global financial crisis 2007-2012. Abstract: Using stochastic dominance (SD) approach, this paper revisits the Ramadan effect in the stock returns of 15 Muslim countries and altogether as a portfolio. Our study is motivated by the preferred statistical attributes of SD analysis. Specifically, SD requires no normal distribution of returns assumption and it imposes few restrictions on investors’ risk-return tradeoff preference. Our results indicate that the Ramadan effect exists in most of Muslim countries used in the study during the sub-periods 1996–2000 and 2001–2006 and in the portfolio during the sub-period 1995–2007. However, its magnitude diminishes during the global financial crisis period (2007–2012). The findings of this paper indicate that previous results are not an artifact deriving from violations of distributional assumptions. We conclude that risk-averse investors would benefit from increased utility by switching from non-Ramadan to Ramadan. Abstract: This study examines the impact of Ramzan effect on return and volatility of the S&P CNX Nifty Shariah index from January 2 9 th December 2006 to 12 September 2013. The closing value of the index extracted from National Stock Exchange of India (NSE) website was converted into continuously compound return and employed GARCH (1,1) model to investigate the impact of Ramzan effect, Ramzan Friday effect and Friday effect on return and volatility of the Shariah index. The study reveals that the Ramzan festival period does not affect the return and volatility of the Shariah index in Indian capital market. However, Friday effect found to be surviving on volatility of the Shariah index in India. Abstract: In this paper we have endeavor ed to examine the consequences of Islamic month Ramadan on the Karachi Stock Market . Monthly data of the last 3 years, 2010, 2011 and 2012 was collected for this paper from yahoo finance. The Effect of Ramadan on KSE market on mean return is examined by including a Dummy variable in regression model. It is observed that returns in KSE market are not showing significant behavior during the month of Ramadan. In the light of observation it is concluded that Ramadan effect is not significant in Karachi Stock Exchange. Abstract: Recent literature shows that the holy month of Ramadan exerts a positive influence on investor sentiment in predominantly Muslim countries. This anomaly has been found to be particularly pronounced in Turkey. We therefore examine whether mutual fund managers investing in Turkish stocks are able to benefit from the Ramadan effect. We find that risk-adjusted performance of domestic institutional funds, hybrid funds and foreign Turkish equity funds is substantially higher during Ramadan compared to the rest of the year. By contrast, domestic index funds fail to deliver higher abnormal returns as they are adversely affected by increased money inflows during Ramadan. Abstract: One of the human characteristic and features is its beliefs. Feature which has important effect on lifestyle, culture, society and decisions making – even economic decisions. Iranian as people that most of them are Muslim has Islamic beliefs. Ramadan is peak of religious beliefs in Islam development in comparison to other beliefs like economic beliefs and soon. In this research, impact of Ramadan as worship and devotion month is exami ned on stock exchange index. Results of this research showed that there is positive and significant relationship between changes of stock exchange index and Ramadan, Shawwal and Rabi Al – Awwal months. However there is negative and significant relationship between stock exchange index and Jumada II, Rabi, Muharram and Rajab months. We examine this relationship for other month and results indicate that there isn’t significant relationship for Jumada al – Awwal, Saffar, Shaban, Dhu al – Hijja and Dhu al Qaeda. Abstract: Observed by more than 1.5 billion Muslims, Ramadan is one of the most celebrated religious traditions in the world. We investigate stock returns during Ramadan for 14 predominantly Muslim countries over the years 1989–2007. The results show that stock returns during Ramadan are significantly higher and less volatile than during the rest of the year. No discernible declines in market liquidity are recorded. We find these results consistent with a notion that Ramadan positively affects investor psychology, as it promotes feelings of solidarity and social identity among Muslims world-wide, leading to optimistic beliefs that extend to investment decisions. Abstract: This paper investigates the Islamic calendar seasonal anomalies in the stock returns of twelve countries where the majority of the population are Muslims. We show empirical evidence of statistically significant Islamic calendar seasonal effects in all twelve countries of our sample. We document evidence of positive and statistically significance returns in the month of Ramadan in Jordan, Kuwait, Pakistan and Turkey. Our results provide some evidence against market efficiency. Abstract: We examine calendar anomalies in Gulf Cooperation Council (GCC) stock markets and document a Friday-type effect that occurs on the last trading day of the week and which we call “Wednesday effect”, since Wednesday is the last day before the weekend in the leading market for the region. This effect, however, is more pronounced outside the month of Ramadan. We also find a statistically significant positive December effect, contrary to the January effect documented in Western countries. The presence of such anomalies may provide money managers with opportunities to optimally time their trades based on daily and monthly price fluctuations. Abstract: In spite of the important role religion plays in peoples’ lives, its impact on financial markets is seldom researched. This study examines the effect of religious experience during the Muslim holy days of Ramadan and Ashoura on the daily returns and trading volumes of 17 Muslim financial markets. Muslim holy days are especially conducive to isolating the elusive effect of faith and decoupling it from potential contaminants. The study documents statistically significant drops in the trading volume and changes in daily stock returns associated with religious experiences on these holy days. The effect on returns is not unidirectional as Ramadan yields a positive impact on daily returns while Ashoura is associated with a negative effect. Ramadan’s more sacred days are associated with a higher magnitude effect culminating on its holiest day,Ramadan 27th. The study utilizes the heterogeneity of worship intensity within the month of Ramadan to validate that the documented effect is indeed a result of religious experience rather than non-faith aspects of the holy days. Abstract: Observed by more than 1.5 billion Muslims, Ramadan is one of the most celebrated religious rituals in the world. We investigate stock returns during Ramadan for 14 predominantly Muslim countries over the years 1989-2007. The results show that stock returns during Ramadan are significantly higher and less volatile than during the rest of the year. No discernible declines in market liquidity are recorded. We find these results consistent with a notion that Ramadan positively affects investor psychology, as it promotes feelings of solidarity and social identity among Muslims world-wide, leading to optimistic beliefs that extend to investment decisions. Abstract: Calendar anomalies in stock returns are well documented. Less obvious is the existence of seasonality in return volatility associated with moving calendar events such as the Muslim holy month of Ramadan. Using a GARCH specification and data for the Saudi Arabian stock market – now the largest stock market in the Muslim world – this paper documents a systematic pattern of decline in volatility during Ramadan, implying a predictable variation in the market price of risk. An examination of trading data shows that this anomaly appears to be consistent with a decline in trading activity during Ramadan. Evidence of systematic decline in volatility during Ramadan has significant implications for pricing of securities especially option-like products and asset allocation decisions by investors in the Islamic countries. Abstract: This paper attempts to explore a seasonal pattem. the Ramadhan effect, in the Pakistani equity market. Ramadhan, the holy month of fasting, is expected to affect the behaviour of stock market in Pakistan where the environment in Ramadhan is different from other months as people devote more time to perform religious rituals and the general economic activity slows down. The effects of Ramadhan on mean return and stock returns volatility are examined by including a dummy variable in regressions and GARCH models respectively. The analysis indicates a signiﬁcant decline in stock returns volatility in this month although the mean return indicates no signiﬁcant change. The Friday 13th Effect holds that stock returns on Friday 13th are significantly lower than for other Fridays. For academics, the interest is mainly in whether this demonstrates investors are rational or superstitious. This article presents a brief review and listing of academic papers on the Friday 13th Effect. The earliest work that almost all papers refer to is Kolb and Rodriguez (1987); which found that stock returns were indeed significantly lower on Friday 13th than on other Fridays. However, in the following years few papers supported this idea. The first paper to rebut it was Dyl and Maberly (1988); this studied the S&P 500 Index for the period 1940-1987 and found that stock returns on the unlucky day were, in fact, slightly higher than on other Fridays. The paper firmly concluded, “There is no Friday the 13th effect”. This was supported by Chamberlain, Cheung and Kwan (1991) who declared the effect just a statistical artefact. Coutts (1999) examined the UK FT30 Index from 1935 and also found the Friday 13th returns slightly higher than other Fridays. A result also found by Lucey (2000) when he analysed FTSE indices for 19 countries. So, by 2010 things were not looking encouraging for the existence of the Friday 13th effect. In the 23 years since the initial paper by Kolb and Rodriguez (1987), all papers published on the topic had rejected it. Then, in 2010, Vähämaa and Peltomaki (2010) launched an effort to somewhat rescue the effect. They decided to interpret the effect a little more loosely and looked also at the trading days immediately prior and following Friday 13th. They found that returns on the days prior to Friday 13th were statistically significant and negative prior to 1981; and that returns on the days after Friday 13th were statistically significant and positive after 1980. This reference to the day following Friday 13th overlapped with the Monday effect, which holds that returns are lower than other days of the week. The result was that their paper found that Friday 13th did influence the stock market. Subsequently, papers have broadened the geographical ambit and started looking for the Friday 13th effect in other international markets. Auer and Rottmann, Horst (2013) failed to find evidence for the effect in Asian emerging markets, except in the Philippines and a reverse effect in South Korea. And Botha (2013), found no evidence for the effect in five African markets. Is there a Friday the 13th effect in emerging Asian stock markets? Abstract: In this article, we revisit the Friday the 13th effect discussed by Kolb and Rodriguez (1987) that has received increased interest in recent research. Using a dummy-augmented GARCH model, we investigate whether the occurrence of this superstitious calendar day has significant impact on the conditional means and variances of returns in the seven emerging Asian stock markets India, Indonesia, Malaysia, the Philippines, South Korea, Taiwan and Thailand. Results obtained for the period from July 1996 to August 2013 indicate no systematic pattern across countries. We can detect a significant Friday the 13th effect only for mean returns in the Philippines and an inverse Friday the 13th effect for South Korea. Volatilities are significantly affected only in Indonesia and the Philippines. They tend to be reduced by the occurrence of Friday the 13th. Abstract: In this study, we investigate whether Friday the thirteenth has an effect on the stock market returns. We report the following findings: (1) The returns prior Friday the thirteenth are lower than normally prior the year 1981. (2) The returns after Friday the thirteenth are higher than normally after the year 1980. (3) Serial correlation in stock indexes is positive prior the year 1981 and negative after the year 1980. (4) Serial correlation between Friday and the following day is significantly lower after Friday the thirteenth. Thus, we conclude that the Monday anomaly is not more evident than Friday the thirteenth anomaly, and the anomalies may be interrelated. Abstract: We examine Friday the thirteenth effect in U.S. stock returns from January 1950 to December 2007. Our results reveal that stock returns on Friday the thirteenth are not significantly lower than that of other Fridays for the overall period. When we examine the differences by decades, we find that Friday the thirteenth returns are significantly lower than returns of other Fridays in only one out of the six sub-periods. We therefore conclude that U.S stock returns do not show evidence of a Friday the thirteenth effect. Abstract: The Friday the 13th anomaly discussed by Kolb and Rodriguez in 1987 is revisited in an international context. Using the FTSE world indices over the period 1988–2000, for 19 countries, it is found that there is some evidence that returns on Friday the 13th are statistically different from, and generally greater than, returns on other Fridays. Abstract: The Friday the 13th anomaly of Kolb and Rodriguez (1987) is revisited in an international context. Drawing on the philosophy of science approach of Lakatos (1978), the paper argues the importance of “anomalies” and the need for triangulation. Using the FTSE world indices over 1988–2000 for 19 countries, it is found that there is some evidence that returns on Friday the 13th are statistically different from, and generally greater than, returns on other Fridays. The paper concludes with a brief discussion of the possibility of an emergent paradigm incorporating work such as Jacobsen and Bouman (1998) and Kamstra, Kramer, and Levi (2000a). Abstract: In recent years much evidence has been documented of the existence of regularities in security price returns. However, one of the least investigated anomalies concerns the socalled ‘Friday the 13th’ effect, where returns on Fridays which fall on the 13th of the month display significantly lower returns than other Fridays. Employing daily logarithmic returns from the Financial Times Industrial Ordinary Shares Index (FT 30) for the period July 1935 through December 1994, we find no evidence of a Friday the 13th effect. Indeed, if anything, we find returns are higher on Friday the 13th than on other Fridays. We then partition the sample into six subsamples each of ten years, again concluding that there is no evidence of a Friday the 13th effect, and that once again returns on Friday the 13th tend to be higher than on other Fridays. Finally, we conclude that our results support the extremely limited evidence documented for the UK market concerning the Friday the 13th effect. Abstract: This paper examines five seasonal patterns in stock markets of eighteen countries: the weekend, turn-of-the-month, end-of-December, monthly and Friday-the-thirteenth effects. We find a daily seasonal in nearly all the countries, but a weekend effect in only nine countries. Interestingly, the daily seasonal largely disappears in the 1980s. The last trading day of the month has large returns and low variance in most countries. Many countries have large December pre-holiday and inter-holiday returns. The January returns are large in most countries and a significant monthly seasonal exists in ten countries. The Friday the Thirteenth Effect: Myth or Reality? Abstract: This study examines the daily return behavior of the Standard & Poor’s composite index over a period of more than half a century for evidence of the Friday the thirteenth effect. The results indicate that the effect is merely a statistical artifact and not the consequence of superstition-induced investor behavior. In addition, after taking into account the tendency for stock returns to be high at the turn of the month, the hypothesis that Friday returns on all days are the same cannot be rejected. 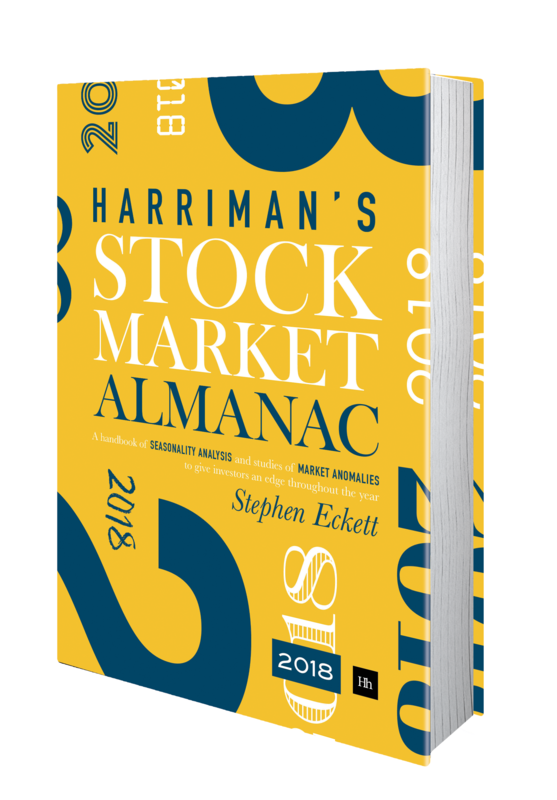 Abstract: We examine returns to Standard and Poor’s 500 Index for all Fridays from 1940 through 1987 and for ﬁve subperiods within this 47-year period. From 1940 to 1987, the mean return to the S&P 500 Index was actually higher on the 82 Fridays falling on the 13th of the month than it was on the 2,315 other Fridays (i.e., those that were not a Friday the 13th), although the difference was not statistically signiﬁcant. There is certainly no evidence of mean returns being lower in Friday the 13th than on other Fridays. In light cf our additional evidence, it appears that the pattern of returns on Friday the 13th reported by Kolb and Rodriguez was a chance occurrence and not the harbinger of yet another puzzling anomaly. There is no “Friday the 13th” effect. Abstract: Many empirical studies have shown that average returns differ for each day of the week, although the underlying reasons remain a mystery. In particular, Friday returns are typically large relative to other days. In our context, this brings up the question of whether Friday the Thirteenth returns differ from the returns of other Fridays.This paper studies whether the mean return for Friday the Thirteenth is statistically different from the mean return for other Fridays. Given the negative connotation associated with Friday the Thirteenth, we test the null hypothesis of equal means for Friday the Thirteenths versus other Fridays against the alternative hypothesis of a lower mean return for Friday the Thirteenth. Our one-sided test results indicate that, in fact, the returns for Friday the Thirteenth have been signiﬁcantly lower than the returns for all other Fridays over a long period. This article presents a brief review and listing of academic papers on football (soccer) and the stock market. The main focus of research on this topic is on whether the results of football games have an effect on share prices – the majority of papers find that they do. For academics, the interest here is that football results provide an easy and quantifiable proxy for mood, and much of this research therefore comes under the ambit of behavioural finance. Further, the existence of betting markets on football results allow researches to add, and indeed quantify, the relationship between expectations and results and to study the effect of their variance. Zuber et al (2005) found that the price behaviour of publicly-quoted English Premier League teams was insensitive to game results; they concluded that a new type of investor gained value from mere share ownership. By contrast, Stadtmann (2006) studied the share price of Borussia Dortmund and found that game results were an important driver of the share price. The research of Berument et al (2006) was partly consistent with both the preceding in finding that the Turkish team Besiktas’s win against foreign rivals in the Winner’s Cup did increase stock market returns, but that no such effect was found for two other Turkish teams: Fenerbahçe and Galatasaray. Palomino et al (2009) found that stock prices did react strongly to game results generating significant abnormal returns and trading volumes; and, further, that winning team share prices experienced a high level of overreaction. Their research also studied the football betting market and found that while betting odds were a good predictor of game outcomes, investors largely ignored these odds, and that betting information predicted stock price overreactions to game results. The research of Benkraiem et al (2009) was largely consistent with those that found game results had an influence on returns and trading volumes; their analysis further showed that the extent of the share price effect and timing of it was dependent on the type of result (win, draw, lose) and match venue (home, away). Berument et al (2009) argued that the share price effect on football teams quoted on the Istanbul Exchange increased with the fanaticism of the team’s supporters. Scholtens and Peenstra (2009) research was again consistent with the finding that match results affected share prices (significant and positive for victories and negative for defeats); and they further found that the effect was significantly stronger for defeats, and stronger in European than for national competitions. Like Palomino et al (2009), Bernile and Lyandres (2011) analysed the football betting markets to find that investors are overly optimistic about their teams’ prospects before games and disappointed afterwards, which leads to abnormal negative returns after games. Bell et al (2012), found that share returns were more influenced by important games for English clubs, where “important” was defined as a game having a particular significance for the club’s league position. Godinho and Cerqueira (2014) also incorporated the concept of game importance; they built a model for 13 clubs of six different European countries that weights games according to a new measure of match importance and using the betting markets to isolate the unexpected component of match results; this model finds a significant link between the results and share performance. Berkowitz and Depken (2014) found that share prices reacted asymmetrically to game results: the negative effect being greater and quicker for losers than the positive effect for winners. They suggested the reason for this is that losing is a stronger predictor of future losing (and lower financial performance) than winning is a predictor of future winning. Ashton, Gerrard and Hudson (2003) found a strong association between the England football team results and subsequent daily changes in the FTSE 100 index. However the methodology employed by Ashton et al (2003) was later criticised by Klein, Zwergel and Fock (2009) who rejected the presence of any link. In response, Ashton, Gerrard and Hudson (2011) carried out new analysis, using a larger dataset, and re-asserted that a link does exist for the original study period of 1984-2002, although they report that the strength of the link has declined over the subsequent period 2002-2009. Edmans et al (2007) also found a link between national soccer results of the market; for example, significant markets falls after soccer losses, and effect stronger for smaller stocks and in more important games. Regarding the FIFA World Cup academic research tends to focus on two areas: the effect of the announcement of the World Cup host and market behaviour during and immediately after the World Cup. Obi, Surujlal and Okubena (2009) found negative abnormal returns for South African shares in the lead up to the announcement that South Africa would host the 2010 World Cup, followed by positive abnormal returns in the aftermath of the announcement. Abuzayed (2013) found evidence of a positive abnormal market return in Qatar linked to the announcement of that country being host for the 2022 FIFA World Cup; and further that the effect was strongest in the service sector. Vieira (2012) analysed the 2010 FIFA World Cup and found no link between games results and subsequent market behaviour. Kaplanski and Levy (2010), found that the average return on the US equity market over the period of the World Cup was -2.6% (compared to an average return of +1.2% for similar periods at other times); this effect did not depend on the games’ results and as the aggregate effect depended on many games it was therefore robust. This result was supported by Ralph (2010) who also found an average return of -2% for the same conditions. Kaplanski and Levy (2013) updated their previous research and found that although an abnormal profit still existed for the 2010 World Cup, the price pattern was different from previous World Cups (possibly due the publication of news of this effect just before the 2010 World Cup). They therefore suggest that this effect will vanish in the future. Abstract: Event studies suffer from a number of potential shortcomings, most notable the possibility of the market reacting to an event before it actually occurs. To avoid this problem, this paper investigates how the stock prices of publicly traded English football (soccer) teams respond to the outcomes of soccer matches which provide two clear and simultaneous signals, good news for the winner and bad news for the loser. We first establish a link between on-field performance and a club’s financial performance and then show that the market responds asymmetrically to good news and bad news, punishing losers faster than winners. This last result arises because losing is a stronger predictor of future losing, and lower financial performance, than winning is a predictor of future winning. Previously, we have reviewed the academic literature on index changes for the FTSE 100 and S&P 500 indices; here we present a brief review and listing of academic papers on other indices. This article presents a brief review and listing of academic papers on stock index changes. Generally, most of the papers found similar effects for companies added to or deleted from indices as has previously been reported for the S&P 500 and FTSE 100 indices. Namely, shares experience positive abnormal returns and increased trading volumes following the announcement of their addition to an index. An exception was Beneish and Gardner (1995) who found that share prices and volumes were not affected for new DJIA companies (probably due to a lack of index funds associated with the DJIA) although shares saw big falls when deleted from the index. Shankar and Miller (2006) found that shares experienced greater increases (declines) when companies were introduced (deleted) from the series of S&P indices, than those companies that just moved between S&P indices. One of the greatest points of difference is whether the index change effects on shares are permanent or temporary. The papers finding the effects permanent were: Hacbedel (2007) with respect to the MSCIEM, and Liu (2011) for the Nikkei 225. While those finding the effects temporary were: Shankar and Miller (2006) for the S&P SmallCap 600 Index, Chakrabarti, Huang, Jayaraman and Lee (2005) for the MSCI indices, and Biktimirov, Cowan and Jordan (2004) for the Russell 2000. What Happens When a Stock is Added to the Nasdaq-100 Index? What Doesn’t Happen? Abstract: Additions to the Nasdaq-100 Index are based primarily on market capitalization rather than on judgments about a firm’s stature in its industry. We analyze abnormal returns upon announcement that a stock will be added to the Nasdaq-100 Index in a multivariate analysis that incorporates several possible alternative factors. We find that only liquidity variables are significant, but that factors representing feedback effects on the firm’s operations and level of managerial effort are not. This evidence suggests that additions to the Nasdaq-100 Index are associated with liquidity benefits but not with certification effects of the type associated with additions to the S&P indexes. Abstract: We examine stock market reactions to changes in the Nasdaq 100 index. We find asymmetric price response accompanied by a significant increase in trading volume on the effective date. Firms added to the Nasdaq 100 Index experience significant increases ininstitutional ownership, the number of market makers, and the number of shareholders. In contrast, firms removed from the index show significant decreases in the number of institutional shareholders. Additions to the Nasdaq 100 Index also show significant increases in four liquidity measures, whereas deletions demonstrate significant decreases in two liquidity measures. These changes in liquidity are related to the abnormal return on the announcement day. Taken together, the results provide support for the liquidity hypothesis. How do shares prices react after a very large fall or rise in prices on one day? Do prices reverse some or all of the change quickly? Most of the academic papers on large one-day price changes address the issue of whether price reversals do occur and, if they do, the extent and duration of the reversal and in what circumstances they happen. This article presents a brief review and listing of academic papers on large one-day price moves. In 1985 De Bondt and Thaler (1985) proposed the overreaction hypothesis, which states that most people overreact to unexpected and dramatic news events. With respect to stocks, this overreaction can cause large one-day changes in share prices, which are then followed by a reversal. Atkins and Edward A. Dyl (1990) found that after large one-day price changes, especially in the case of declines, the market reversed quickly, but the widening of the bid-ask spread made it difficult to exploit this. A little later Turner and Weigel (1992) found no evidence of short-term market reversals after large one-day price moves. This was followed a couple of years afterwards by the, so far, most cited work on the topic Cox and Peterson (1994), which argued that any observed short-term price reversals were due to changes in the bid-ask spread. They further observed that shares with large falls continue to perform badly beyond the short-term. In other words, the overreaction hypothesis doesn’t hold. This was largely supported by Park (1995) a year later, who found that price reversals disappeared on the following day if the average of the bid-ask prices was used. After the following day, however, the paper did find systematic abnormal reversal returns. Wong (1997) found that prices tend to rise after large one-day advances and fall after large one-day declines (i.e. no reversals), which supported Cox and Peterson (1994) and not De Bondt and Thaler (1985). From 2001, some papers started taking a more nuanced view of this by analysing the type of news that had caused the large price move. Pritamania and Singal (2001) found that if the news relates to earnings or analyst recommendations then the 20-day abnormal returns become much larger ranging from 3% to 4% for positive events and about -2.25% for negative events. This trend of analysis was continued by Larson and Jeff Madura (2003), who found that there was overreaction to strong price rises in the absence of news (defined as news appearing in the WSJ), but no overreaction to price rises accompanied by news. Fehle and Zdorovtsov (2003), cut straight to the chase to analyse whether money could be made in the case of large one-day declines. They found that stocks did overreact in this situation, that the subsequent reversals could be profitably traded and that trading profits were correlated with the size of the fall. Further, following on from the above, they found that the reversals were greater for those stocks with no concurrent associated news. This was consistent with Daniel, Hirshleifer and Subrahmanyam (1998) and Hong and Stein (1999). Sturm (2003) focused on the asymmetry of reactions: finding that large price decreases are followed by positive returns (i.e. reversal), but large price increases do not drive positive or negative abnormal returns. Ma, Tang and Hasan (2005) found a difference in behaviour between markets with strong evidence of price overreactions for Nasdaq stocks but not NYSE. This was followed by Zawadowskia, Andor and Kertész (2006) who did find significant reversal behaviour but that, while widened bid-ask spread for NYSE stocks eliminated profit potential, this was not the case for Nasdaq stocks where the bid-ask spread was unchanged offering the potential for significant short-term profits. With respect to the UK market, Mazouz, Joseph and Joulmer (2009) found continuation, rather than reversal, behaviour after large moves. And then Gu (2013) found that the market does usually reverse its direction in the day after the large move. Abstract: Significantly higher volume in a few day window combined with significantly higher opening may signal a big up day. Negative relationships between return and volume over a three-day window may signal the danger of a big down day. Opening prices of all the big down days are significantly higher than the day’s low and close, and opening prices of all the big up days are significantly lower than the day’s high and close. The market usually reverses its direction in the day after the big day. A strategy is developed for excess returns. The S&P 500 Index Effect describes the tendency for companies joining the S&P 500 Index to experience a positive and permanent impact on their share prices and betas. Whether the effect actually exists and, if it does, if the effect is symmetric (i.e. do companies leaving the index experience a fall in price and beta), and whether the effect is permanent. This article presents a brief review and listing of academic papers on the S&P 500 Index Effect. The following papers found that the share prices of companies joining the S&P 500 Index experienced positive abnormal returns and that this effect was permanent: Beneish and Whaley (1997), Beneish and Whaley (2002), Chen, Noronha and Singal (2004), Cai (2007), Kappou, Brooks and Ward (2008) and Hrazdil and Scott (2009). While some found the effect on price only temporary: Harris and Gurel (1986), Lynch and Mendenhall (1997) and Pruitt and Wei (1989). Some found the effect asymmetric, whereby prices did not fall for companies leaving the S&P 500: Chen, Noronha and Singal (2004) and Zhou (2011). After inclusion in the index these papers found that comovement (beta) increased: Barberis, Shleifer and Wurgler (2005), Kasch and Sarkar (2011) and Kasch and Sarkar (2012). The excess demand is due to indexing in the presence of downward sloping demand curves: Shleifer (1986), Beneish and Whaley (1996), Lynch and Mendenhall (1997) and Wurgler and Zhuravskaya (2002). The bid-ask spread decreases which results in improved liquidity: Hegde and McDermott (2003) and Erwin and Miller (1998) . Investor awareness increases: Dhillon and Johnson (1991), Chen, Noronha and Singal (2004), Elliott, Van Ness, Walker and Wan (2006) and Xie (2013). Analyst coverage increases: Kalok Chan and Hung Wan Kot and Gordon Y.N. Tang (2013). Operating performance of the companies improves: Denis, McConnell, Ovtchinnikov and Yu (2003), Kalok Chan and Hung Wan Kot and Gordon Y.N. Tang (2013), Jain (1987) and Dhillon and Johnson (1991). The following found that inclusion in the S&P 500 Index was not an information-free event: Geppert, Ivanov and Karels (2011), Gygax and Otchere (2010), Cai (2007) and Denis, McConnell, Ovtchinnikov and Yu (2003). The following papers looked at the effect of index changes on index funds: Madhavan and Ming (2002), Chen, Noronha and Singal (2006), Dunham and Simpson (2010), Kappou, Brooks and Ward (2010) and Green and Jame (2011). Stock price response to S&P 500 index inclusions: Do options listings and options trading volume matter? Abstract: This study investigates the stock price response to Standard & Poor’s (S&P) 500 index inclusions during the period 1996–2010 and the role of options listings and options trading volume with regard to the information content of index inclusion announcements. Specifically, we address the following questions: (1) Is the magnitude of abnormal returns from the announcements of S&P 500 inclusions significantly lower for stocks with options listings? and (2) Is the magnitude of abnormal returns from the announcements of S&P 500 inclusions significantly lower for stocks with a high level of options trading volume? Our findings indicate that options listings themselves are not related to the magnitude of abnormal returns from the announcements of S&P 500 inclusions. We also find that greater levels of options trading volume do not convey private information about the S&P 500 index changes. We document that any measurable impact of options trading on the stock price response to S&P 500 inclusion announcements lies primarily in the level of abnormal options trading volume in the period immediately preceding the announcements. The daylight saving effect argues that sleep disruption caused by daylight saving time changes results in a negative impact on stock returns on the trading day following the changes. Even if the effect does exist it’s unlikely to be economically significant, but it is interesting to academics in the context of behavioral finance and whether external factors (such as the weather) can influence the mood of investors sufficiently to affect share returns. Compared to other market anomalies this is a pretty straight-forward one; the academic debate has largely centered around methodology. This article presents a brief review and listing of academic papers on the daylight saving effect. An academic paper in 1976 found that transitions to and from daylight saving time (DST) caused sleep desynchronosis (disruptions). One paper described it as having an effect similar to jet lag. In 1980 a paper claimed that DST changes led to an increase in traffic accidents; while another paper a little later claimed it led to a decrease in accidents. Oh well. As far as we’re concerned the story starts in 2000 when Kamstra, Kramer and Levi found that in the US, UK, Canada and Germany DST had a negative impact on stock returns on the trading day following the changes. They called this the daylight saving anomaly. A new anomaly – this was quite exciting, nowadays there aren’t that many new anomalies found in stock markets (certainly not in developed markets). Anyway, this got the ball rolling. Unfortunately not many others agreed with them. First up was Pinegar (2002) who looked at the US market and only found significance for the autumn DST changes, and that that was attributable to two data outliers for the market in October 1987 and October 1997. Kamstra, Kramer and Levi (2002) replied quickly to this maintaining their claims by showing that the distribution of returns on days following DST changes shifted to the left. Next up was Worthington (2003) who found no effect in the Australian market. Lamb, Zuber and Gandar (2004) replicated and agreed with the findings of Pinegar (2002) and aggressively concluded that the original findings of Kamstra, Kramer and Levi (2000) “did not survive serious scrutiny”. The disagreements continued with Müller, Schiereck, Simpson and Voigt (2009) who found no daylight saving effect in European bond and equity markets. Gerlach (2010) had a different slant, claiming that any correlation between stock returns and DST changes was not due to the daylight saving effect but rather to seasonal patterns in market-related information. Gregory-Allen, Jacobsen and Marquering (2010) criticized the original paper for using too little data; and crunched the numbers on 22 markets and over a longer period. They found no evidence of an observable DST effect on stock returns. Berument, Dogan and Onar (2010) widened the study to look at volatility as well as stock returns, and found no DST effect. This started a merry game of paper ping-pong with Kamstra, Kramer and Levi (2010) replying with a “comment” that criticized the analysis of Berument, Dogan and Onar (2010) and maintaining the effect was still in place. Berument and Dogan (2011) replied with a “reply”, effectively saying, “isn’t”. Which prompted Kamstra, Kramer and Levi (2013) to reply with a “rebuttal” to the “reply” to the “comment” effectively saying, “is”. Abstract: In a 2011 reply to our 2010 comment in this journal, Berument and Dogen maintained their challenge to the existence of the negative daylight-saving effect in stock returns reported by Kamstra, Kramer, and Levi in 2000. Unfortunately, in their reply, Berument and Dogen ignored all of the points raised in the comment, failing even to cite the Kamstra, et al. comment. Berument and Dogen continued to use inappropriate estimation techniques, over-parameterized models, and low-power tests and perhaps most surprisingly even failed to replicate results they themselves reported in their previous paper, written by Berument, Dogen, and Onar in 2010. The findings reported by Berument and Dogen, as well as by Berument, Dogen, and Onar, are neither well-supported nor well-reasoned. We maintain our original objections to their analysis, highlight new serious empirical and theoretical problems, and emphasize that there remains statistically significant evidence of an economically large negative daylight-saving effect in U.S. stock returns. The issues raised in this rebuttal extend beyond the daylight-saving effect itself, touching on methodological points that arise more generally when deciding how to model financial returns data. Every quarter the constituents of the FTSE 100 Index are reviewed, some companies may be removed to be replaced by others. An effect has been observed whereby companies joining the FTSE 100 Index experience a positive and permanent impact on their share prices. This article presents a brief review and listing of academic papers on changes made to FTSE indices. Traders are interested in changes to equity indices due to the potential arbitrage profits; but academics have a wider interest because for them changes to indices act as something like a laboratory for testing theories of stock market efficiency and behavioural finance. Briefly, when a stock joins (or leaves) an index, nothing changes to the company itself and so (in an efficient market) there should be no change to the share price. Academics therefore get excited (the term is used here relatively loosely) when this is not the case. Kougoulis and Coakley (2004) found that shares joining the FTSE 100 Index experienced an increase in comovement (price movement correlation with other shares); shares leaving the index experienced the opposite effect. Mase (2008) supported the previous findings and in addition found that increases in comovement had become larger in recent years, and that the overall increase in comovement was due to new additions to the index rather than previous FTSE 100 constituents re-joining the index. Another favourite of academics. If a share price moves without new information is the move temporary (price pressure hypothesis) or permanent (imperfect substitutes hypothesis)? Mazouz and Saadouni (2007) found strong evidence for the price pressure hypothesis: prices increased (decreased) gradually starting before the index change announcement date of inclusion (exclusion) and then reversed completely in less than two weeks after the index change date. The existence of the temporary price changes (price pressure hypothesis) was also found by Opong and Antonios Siganos (2013) and Biktimirov and Li (2014). Interestingly, Mase (2007) comments that the temporary prices changes to shares joining/leaving the FTSE 100 Index is in contrast to the case for S&P 500 index changes where permanent price changes have been found. Daya and Mazouz and Freeman (2012) (and other papers) found that informational efficiency improved for stocks added to the FTSE 100, but did not diminish after deletion. Now, onto the more useful topics. Gregoriou and Ioannidis (2006) found that price and trading volumes of newly listed firms increased. That confirms what we already knew or suspected. But, interestingly, they (and other papers here) attribute the cause to information efficiency: stocks with more available information increase investor awareness. However, Mase (2007) does say that investor awareness and monitoring due to index membership do not explain the price effects. But not mentioned here is the influence of index funds. And, finally, the interesting stuff. Fernandes and Mergulhao (2011) found that a trading strategy based on addition/deletion probability estimates gave an average daily excess return of 11 basis points over the FTSE 100 index. Opong and Siganos (2013) found “significant net profitability” from an investment strategy based on firms on the FTSE reserved list. And a strategy based on the FTSE 100 quarterly revisions was profitable if CFDs were used and traders could deal within the bid/ask spread. Abstract: We examine market reactions to changes in the FTSE SmallCap index membership, which are determined quarterly based on market capitalization and are free of information effects. Our main results are asymmetric price and liquidity responses between the firms that are shifted between FTSE indexes and the firms that are new to FTSE indexes. Firms promoted from a smaller-cap to a larger-cap FTSE index experience a permanent increase in stock price accompanied by improvements in liquidity. Similarly, firms demoted from a larger-cap to a smaller-cap FTSE index experience a permanent decrease in stock price accompanied by declines in liquidity. In contrast, firms added to the FTSE SmallCap index that were not previously in FTSE indexes show a transitory price gain and declines in liquidity. The results support the liquidity and price pressure hypotheses. While, of course, there are many very serious – and fascinating – academic papers on finance, such as Multifractality and long-range dependence of asset returns: the scaling behavior of the Markov-switching multifractal model with lognormal volatility components, there are other papers that are…well, a little strange. This article lists ten such papers. A strong contender for the Paper in Poor Taste Award would be the one below looking at the influence of sudden celebrity deaths on the stock market (the inclusion of the word “sudden” in the title will no doubt be appreciated by the judges of this award). John Kay recently wrote an excellent article about the wisdom of crowds (The parable of the ox); appearing here is a paper that tackles the same topic but in a rather left-field context. The paper finds that the price movements of tourism stocks on the Tel Aviv Stock Exchange more accurately forecast the success of ceasefire agreements in the Levant than did editorials in the Jerusalem Post and New York Times. How is your well-being? The authors of a paper here believe it (that is, your well-being) is affected by the stock market and that the government should do something about it. And if the government doesn’t do something about it, this other paper reckons we’re all going to the loony bin. Finally, nomination for one of the creepiest papers must go to the one here that found that when CEOs are away from their headquarters companies announce less news than usual. Fair enough, but to analyse this the author identified CEO absences by “merging corporate jet flight histories with records of CEOs’ property ownership near leisure destinations”. We’ve had shareholder activists, are we now to see the rise of shareholder stalkers – would-be analysts hiding in the bushes with binoculars checking on the holiday timetables of CEOs? Abstract: The efficiency of global financial markets has long been a topic of contention for both academics and industry professionals alike. Evidence suggests that most of the time, asset markets do a good job of correctly processing and assimilating information into prices. However, a substantial literature has built up proof which indicates that this is quite often not the case. A wide variety of anomalies and so called ‘effects’ have been documented revealing stock price behaviour that is inconsistent with the predictions of traditional models. These inconsistencies illustrate departures from theory and are unexplainable within the mainstream economics paradigm; conversely, many anomalies can be accounted for using explicit insights from behavioural finance. This study discusses the theoretical debate and investigates whether financial markets are affected by superstition and if so, if this is reflected in asset prices. A new discovery is added to the literature, namely the Friday 17th anomaly; with regard to the Italian MIB Storico index results indicate that in comparison to regular Fridays – which are aggregately positive – returns for Friday the 17th are four times larger and statistically different. Abstract: Old traditions never die; they just fade away. However, some are still deeply embedded in our life and practiced every day. This paper examines some notable Taiwanese ghostly legends, testing their potency on the stock markets. The results show that though some ancient beliefs still carry heavy weight in our daily life ostensibly, their impact on the stock market has been negligible. To be sure, some of the customs of our ancestors may have lingered around long er than expected, but contrary to our expectations, their spirits have languished, showing no vigor as financial guidance.